Joseph B.C. 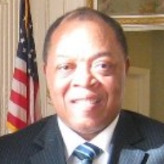 Foe-Atangana presented his credentials as Cameroon’s Ambassadsor to the United States September 12, 2008. He replaced Jérôme Mendouga, who was relieved of his duties after he was accused of fraud regarding the purchase of an airplane for Cameroon’s president, Paul Biya. Three years earlier, Mendouga, who had represented Cameroon in the U.S. since 1994, fought off accusations of embezzlement. Prior to his appointment, Foe-Atangana served for several years as Cameroon’s consul general in Calabar, Nigeria.